On August 31st, there are 1068 potentially hazardous asteroids. On September 21, there are 1069 potentially hazardous asteroids. On October 18, there are 1078 potentially hazardous asteroids. On November 1, there are 1077 potentially hazardous asteroids. On November 3, 2009 there were 1077 potentially hazardous asteroids. "I've never seen anything like it before," says photographer Maria Doty. "It was a very unusual sight and the colors were bright." The technical name for this phenomenon is circumzenithal arc or "CZA" for short--and it's no rainbow. 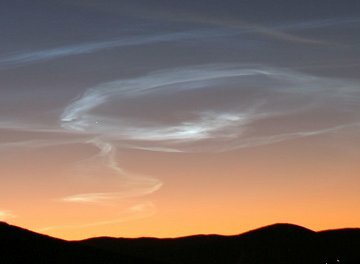 CZAs are formed by sunlight shining through plate-shaped ice crystals in high clouds. 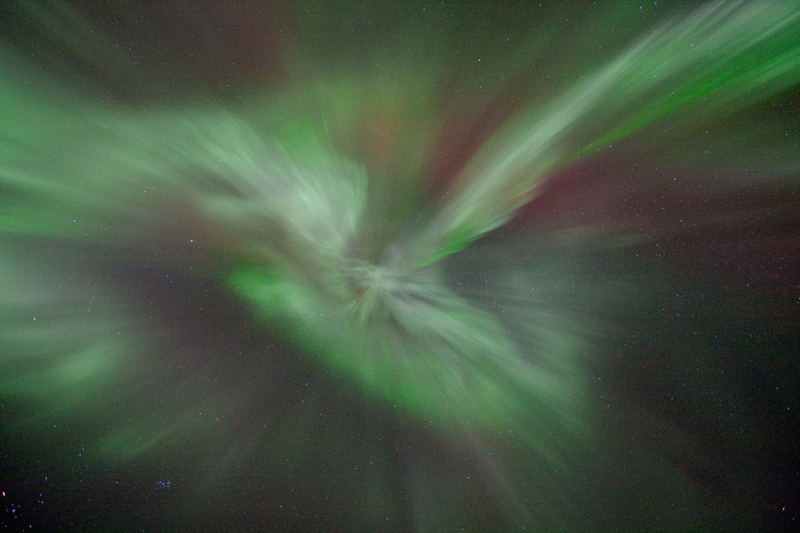 Atmospheric optics expert Les Cowley calls it "the most beautiful of all ice haloes." First timers often describe the CZA as an 'upside down rainbow' and "someone has also likened it to 'a grin in the sky,'" he adds. Circumzenithal arcs typically appear in late autumn and early winter when the air is icy and the sun is low. "The CZA forms only when sun is less than 32.3° high," notes Cowley. 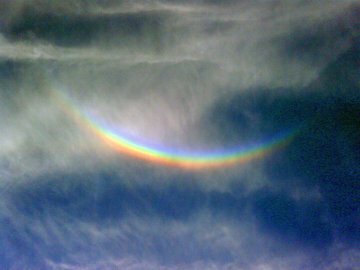 As winter solstice approaches, "upside down rainbows" will become increasingly common. Look for them! EXTRATERRESTRIAL AURORAS: Lately, NASA's Cassini spacecraft has been monitoring some lovely Northern Lights--on Saturn! Saturn's auroras tower 750 miles above the planet's atmosphere, forming a ring of shimmering light wider than Earth itself. Mission scientist Andy Ingersoll discusses the findings in a 40 MB video from NASA. 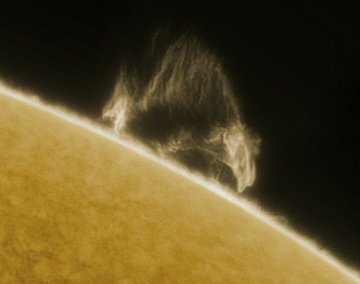 Right: The dancing prominence (circled). Watch it bounce up and down after getting hit by a faint but powerful solar tsunami: 4 MB gif animation, 54 MB Quicktime movie. of new Solar Cycle 24. The surge occurred when Earth passed through a double-stream of debris from Comet 55P/Tempel-Tuttle. We call it a "double-stream" because it consists of dust ejected from the comet on two occasions, in 1466 AD and 1533 AD. Earth is exiting the double-stream now, but we're not out of it yet. Be alert for Leonids between midnight and dawn: sky map. LISTEN: The Air Force Space Surveillance Radar is scanning the skies above Texas, and when a Leonid passes over the facility--ping!--there is an echo. 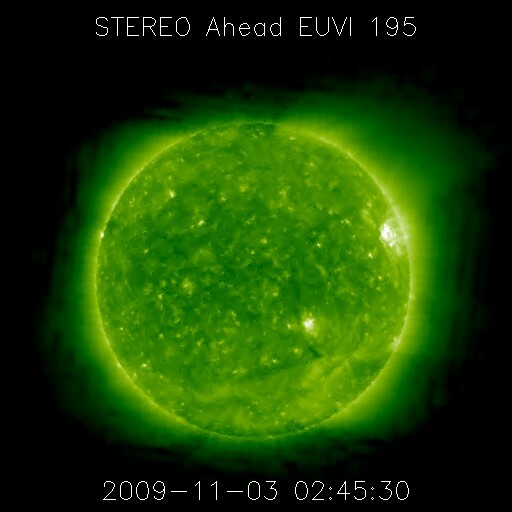 Tune into Spaceweather Radio for a live audio feed. "Now sky watchers around the Arctic Circle enter the long polar night when the sun doesn't rise at all. How long this period lasts depends on your latitude. 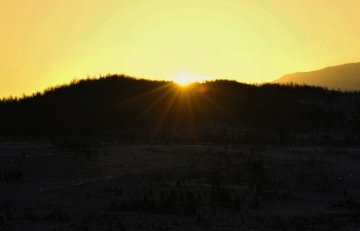 Here in northern Norway, the sun won't be back until the end of January." Tiny sunspot 1031 is a member of new Solar Cycle 24. SUNSPOT CORPSE: Sunspot 1029 has returned from the farside of the sun--and it is not impressive. All that remains of the former behemoth is a bright magnetic froth. Readers with solar telescopes should target the northeastern limb of the sun to see a sunspot corpse. "This magnificent looping prominence stole the show from the corpse of sunspot 1029," says Friedman. 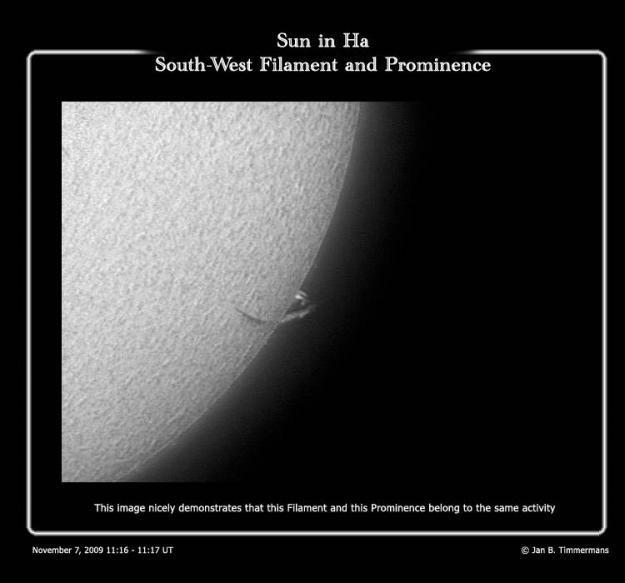 "It was the most dramatic prominence I have seen in many months." The same prominence was putting on a show this morning, Nov. 15th, when the sun rose over the Philippines. "I was elated when I was able to see it clearly visible in the field of my eyepiece!" reports James Kevin Ty from Manila. "I quickly set up my PST (Personal Solar Telescope) and was able to monitor the prominence for more than 2 hours." WATER ON THE MOON: Last month when NASA's LCROSS spacecraft hit the Moon and failed to produce a bright flash, many observers thought the experiment was a dud. Think again. NASA has announced that LCROSS discovered water at the bottom of crater Cabeus near the Moon's south pole. The red curve traces what the spectrum would have looked like if the debris cloud had been made of nothing but moondust and pure water vapor. Points with error bars are the actual data. Clearly, water is present, but that's not all. "Along with the water in Cabeus, there are hints of other intriguing substances," says Anthony Colaprete, the mission's principal investigator the NASA's Ames Research Center. "The possibility of contamination from the Centaur rocket [has been] ruled out," so any unidentified compounds are likely native to the Moon. What are these mystery substances? Remember, LCROSS targeted a "cold trap" where materials have been freezing and accumulating for billions of years. It could be almost anything. Researchers are still studying the spectra for clues. "Full understanding of the LCROSS data may take some time," notes Colaprete. "The data are so rich." STUCK ON MARS: NASA is about to begin transmitting commands to its Mars rover Spirit as part of an escape plan to free the venerable robot from a Martian sand trap. Officials say there is little hope of freeing Spirit, with a best case senario of "severe wheel slippage" and "barely detectable forward progress." On the bright side, Spirit is stuck in a very interesting spot. Science@NASA has the full story. The swelling limb-glow heralds the approach of sunspot 1029, the biggest and most active sunspot of the year. Sunspot 1029 spent the past two weeks transiting the farside of the sun, invisible from Earth, but now it is about to reappear. Friday the 13th kicks off a 2- to 3-day photo-op as the sun's rotation slowly turns the active region back toward Earth. Readers with solar telescopes are encouraged to monitor developments. AROUND THE BEND: The "green sun" pictured below is an ultraviolet-wavelength photo taken just hours ago by NASA's STEREO-B spacecraft. What lies beneath the circled thicket of hot plasma and magnetic fields? It could be the most active sunspot of the year. 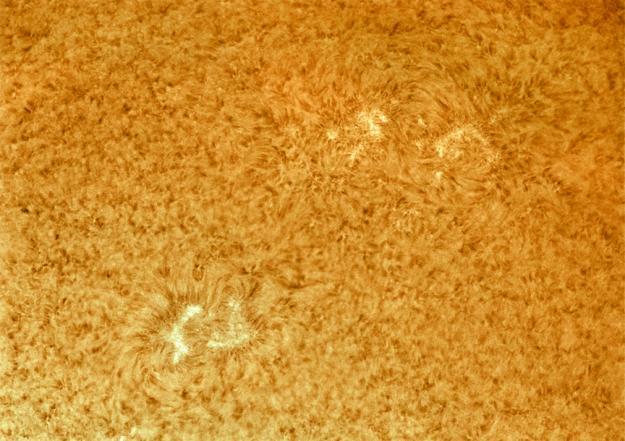 The circle marks the location of sunspot 1029. In late October, sunspot 1029 materialized on the Earth-facing side of the sun and quickly established itself as the biggest active region of 2009. It produced more than ten C-class solar flares, single-handedly quadrupling the number of such eruptions since the year began. 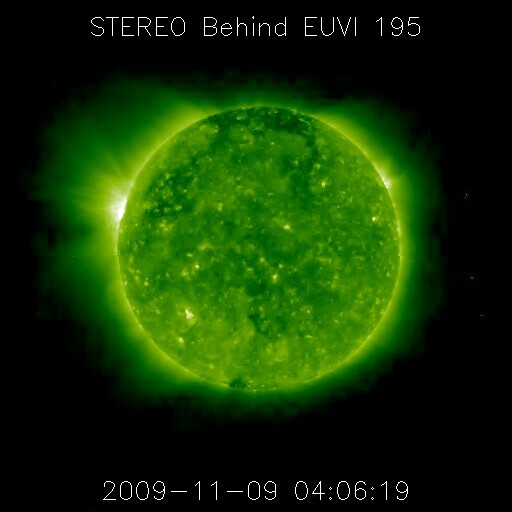 For the past 11 days, however, sunspot 1029 has been out of sight transiting the farside of the sun. 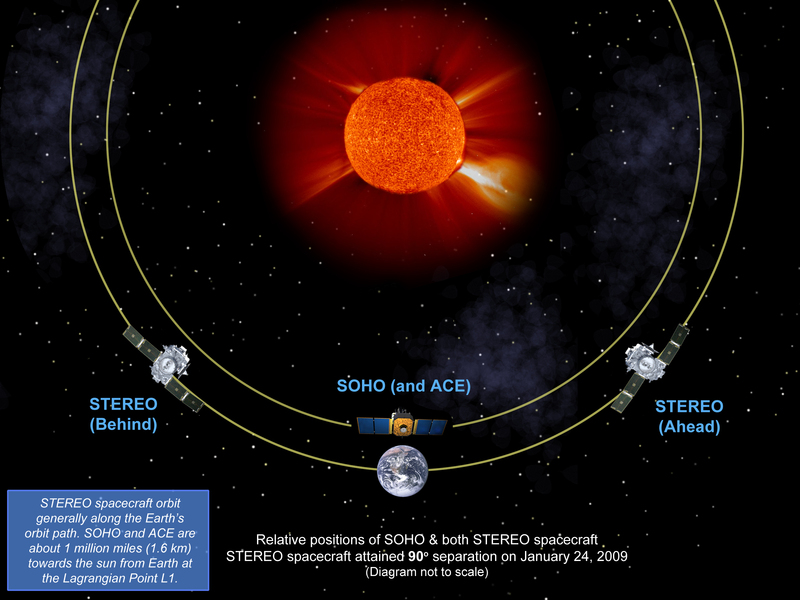 The sunspot is still invisible from Earth, but STEREO-B can see it because the spacecraft is stationed over the sun's eastern horizon. The glaring knot of extreme ultraviolet activity hides the sunspot's underlying dark core from STEREO's UV telescopes, and this limits how much we know about it. Has sunspot 1029 broken apart and diminished during its long farside transit? Or is it still its old active self? Answers will be revealed in 3 days when solar rotation turns sunspot 1029 toward white-light cameras on Earth. 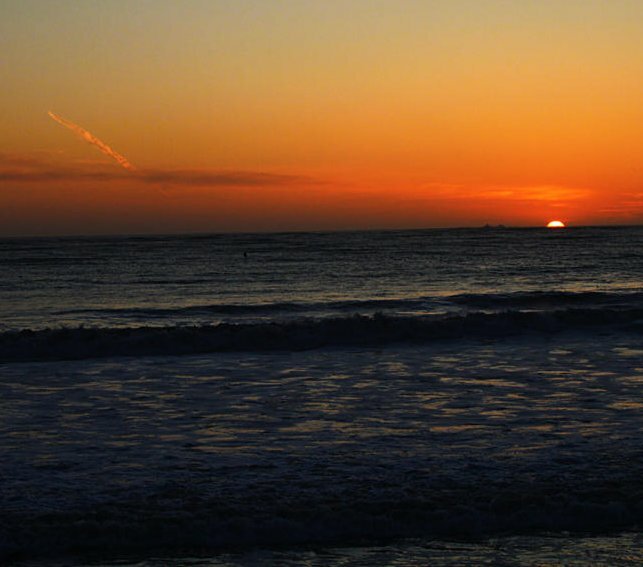 "Pepper Dela Cruz took this picture outside the Miramar Restaurant in Half Moon Bay on the San Francisco Peninsula just as the sun was setting," says Doug Moore, who submitted the photo on Pepper's behalf. "It shows debris from the fireball, which lasted for several minutes before dissipating." The origin of the fireball is still uncertain. Meteor expert Peter Jenniskens of NASA's Ames Research Center believes it was "a small, random asteroid that crashed into our atmosphere. The remains [of the space rock] probably landed in the Pacific Ocean," he says. More fireballs are in the offing. Earth is passing through a stream of debris from Comet 2P/Encke, and this is causing the annual Taurid meteor shower, which peaks between now and Nov. 12th. The shower only produces about 5 meteors per hour, but what the display lacks in number, it makes up for in dazzle. Taurids tend to be fireballs, slow and very bright. The best time to look is during the hours around midnight when the constellation Taurus is high overhead: sky map. Note: Based on the time of day and other factors, Jenniskens says "the Bay Area fireball was probably not a Taurid." 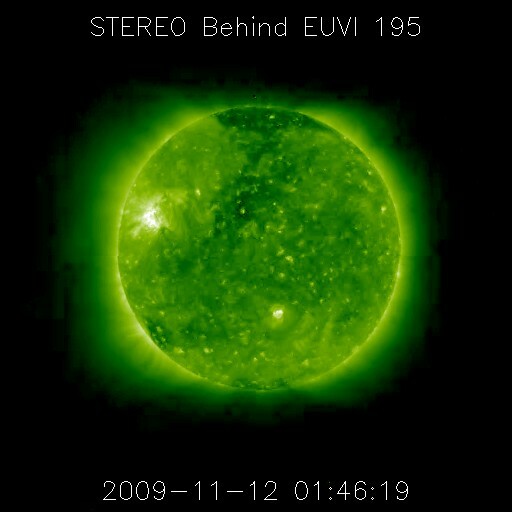 A farside eruption on Nov. 5th (movie) suggests that the sunspot is still active. In late October, the last time we saw it on the Earth-facing side of the sun, sunspot 1029 unleashed more than 10 C-class solar flares, single-handedly quadrupling the total number of flares in all of 2009. The sun's rotation will turn the active region back toward Earth about four days from now. Until then, STEREO-B will keep us informed. Stay tuned. The portion of the filament seen in front of the sun looks dark, because it is cooler than the inferno below. But note how the filament glows in projection against the black space beyond the limb. The glow comes from plasma trapped inside the filament--not as bright as the surface of the sun, but definitely brighter than the void. Red traces the distribution of sodium atoms detected by a spectrometer onboard MESSENGER. "The neutral sodium tail, so prominent in our first two flybys of Mercury, is now significantly reduced in extent," announced planetary scientist Ron Vervack at a NASA press conference yesterday. The material in Mercury's tail comes from the surface of the planet itself, which is blasted by solar wind and micrometeorites. During MESSENGER's recent flyby of Mercury, the net effect of solar radiation pressure was small, and the sodium atoms were not accelerated away from the sun as they were during the earlier flybys, resulting in a diminished planetary tail. That's space weather. Get the full story from Science@NASA. This impressive sunspot, which rotated over the sun's western limb three days ago, does not add to the sunspot number because it is no longer visible from Earth. Astronomers only count spots that are on the Earth-facing side of the sun. That's how it's been done since Rudolph Wolf invented the sunspot number in 1848. In those days, only one side of the sun was visible from Earth, so the tradition was established. Now, however, for the first time in the history of astronomy, NASA's twin STEREO spacecraft are seeing over the sun's horizon, tracking sunspots that officially "don't count." The two spacecraft are moving toward opposite sides of the sun, and by February 2011 the entire sun will be under their watchful eyes. Perhaps it is time to start thinking about a "whole sun" sunspot number. 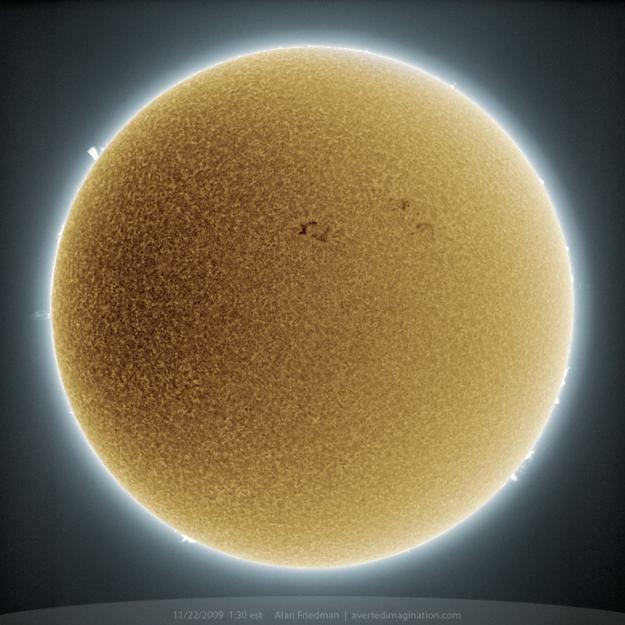 As today's image shows, the sun is not always as blank as it appears to be. BLUE ICE ON THE RED PLANET: Wake up before dawn, go outside, and look straight up. That eerie red "star" staring back down at you is Mars. The red planet is approaching Earth for a close encounter in January 2010 and it is already brighter than a first-magnitude star. 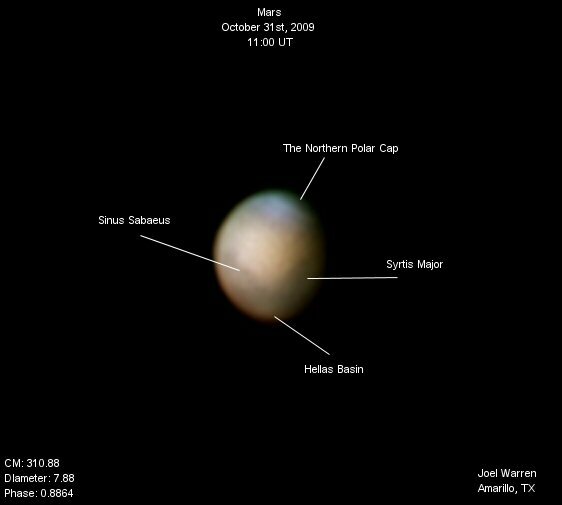 "Mars' north polar cap is big enough and bright enough to be seen though most backyard telescopes at medium to high power," says Joel Warren of Amarillo, Texas, who took the picture, above, on Halloween using an 11 inch Celestron telescope. On Mars, northern winter has just ended and clouds which normally hover over the martian arctic are breaking up, allowing the planet's great ice cap to be seen. "This apparition will offer observers the best view of the North Polar Region to be had in many years," notes Warren. The blast reinforces sunspot's 1029's position as the most active sunspot of 2009. Last week alone, the sunspot produced ten C-class solar flares, more than tripling the number of flares in the previous 10 months. Sunspot 1029 is a member of long-overdue Solar Cycle 24. Is it also a herald of more active times to come? SEE OCTOBER PAGE FOR LARGER IMAGE. reach Earth on or about Nov. 6th.